This post contains affiliate links which means I receive a commission if you make a purchase using the links in this post. Certain products were recieved as PR samples. Hello Glam Fam! If your life is anything like mine, there never seems to be enough time to enjoy little luxuries. After countless #SelfcareSunday posts, I was inspired and decided to take matters into my own hands. One Sunday night, I created a relaxing retreat for myself right at home inspired by my amazing time at the milk + honey Spa in Austin. ​​​​​​​My "spa time" was after I put the kids to bed so it was already late. I didn't have much time, but I wanted it to count! It only took a total of 45 minutes from start to finish. Turn on your favorite playlist OR keep it quiet if you prefer to relax in silence. Dim the lights if you can! Put your hair up too. If you want, grab a glass of wine while the bath is running. I know I know... in my pictures, there are roses! That's NOT my norm but I did it for the beautiful images (and had roses left over from my a different project). 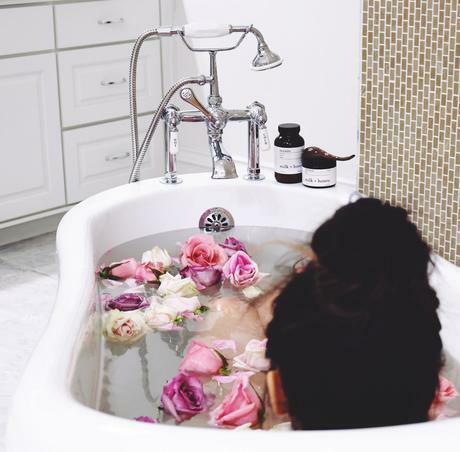 If you want to fill your bathtub with gorgeous flowers, then please do! Flowers can make you happy by triggering certain brain chemicals like serotonin, dopamine, and oxytocin. Start the bath water. I usually make it warmer than I want so that it will stay heated for a while after I get in. After it is about 3/4 full, then throw in your favorite bath product. I used milk + honey No 5 milk bath. 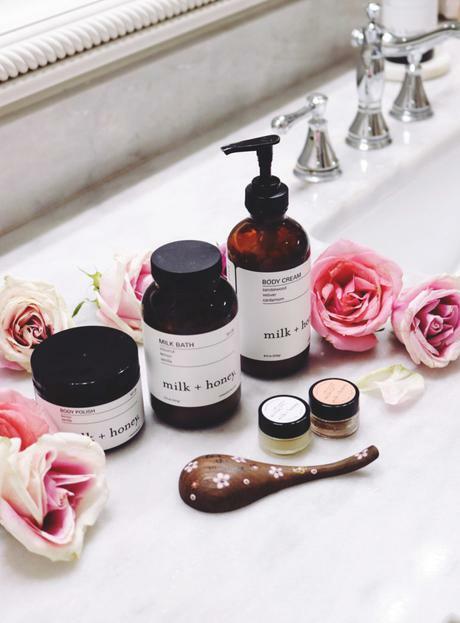 SIDE NOTE: The milk + honey No 5 collection is SO LUXURIOUS! The lemon and vanilla smell good enough to eat, and the organic coconut milk leaves your skin so soft. Seriously, just smelling the open bottle makes me happy. All of their products are hyperclean and nontoxic. And y'all, this is NOT a sponsored post. I just LOVE LOVE LOVE their brand and their products. Now that your bath is ready, get in! This is the best part!!! I got in and took some deep breaths of that citrus and vanilla goodness. 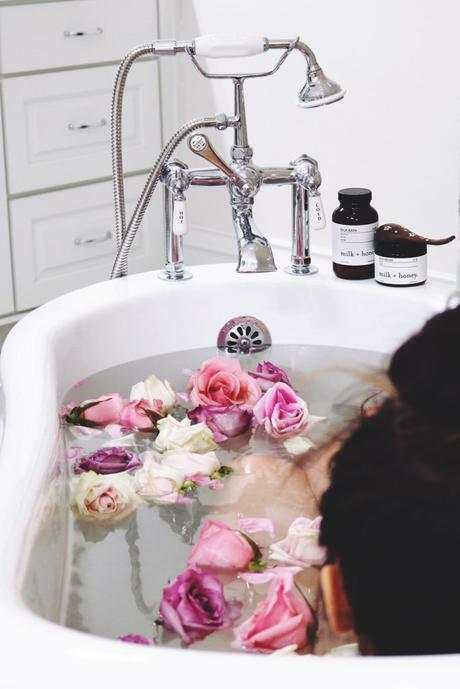 Give yourself a good 20 minutes to enjoy the bath. Think about 3 things that you are grateful that happened during the day. Meditate to some relaxing music. Don't forget to wash off your face mask if you applied one. After 10 minutes, I washed mine off. Go an extra step and use a body polish on your chest, arms, and legs! Be kind to yourself. There's only one of you! Take some time to rest and relax so your outer beauty can shine from within. There you go! 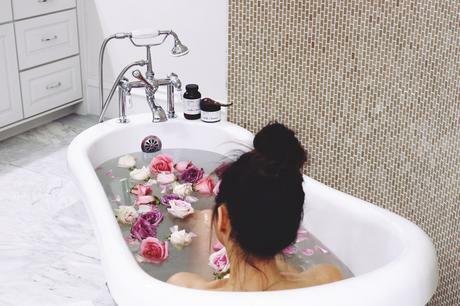 It's simple and easy to recreate a little spa time or self-care at home! And really, you just need to find something for YOU for an hour whether it's a relaxing bath, yoga, listening to music, reading your favorite fiction book, etc. ​​​​​​​WHAT DO YOU FOR RELAXATION?? ​​​​​​​P.S. For those of y'all who are local, milk + honey is opening a location at The Shops of Clearfork later this month!!! I literally CAN'T WAIT since I purchased a pedicure package a couple of months ago. 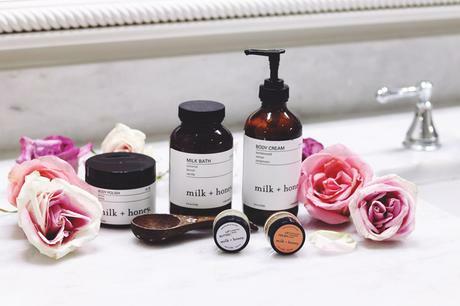 ​​​​​​​ALSO, milk + honey has just released their skincare line!! I was lucky to receive pre-launch samples and still in the testing phase. However, I have to say that the rose toner and intense hydrating cream are heavenly so far. I will be doing a separate post on their skincare line later! Thank you so much for stopping by and supporting SOS! I truly appreciate it!